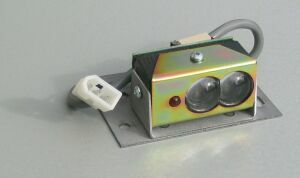 The Redline IR replacement scoring ball sensor directly replaces Brunswick AS90 and later scoring system ball sensors. They also replace Pro-Score and Joystick ball sensors. Redline IR ball sensors are extremely sensitive and stable. They are impervious to changing light conditions and resistant to slight movements from vibrations. These sensors outperform just about every scoring ball sensor in use today. They operate from 5VDC to 24VDC and use very little current. Redline IR ball sensors are a true set it and forget it sensor. Anyone who has serviced scoring systems knows that if the ball sensors don’t work, the whole system won’t work. If you are looking for replacement Ball Sensors, try Redline IR Ball Sensors, they work better and are priced better. Guaranteed! Call today to check compatibility with your scoring system. Need to know more? Call 1-(888)-569-7845 today.